The manufacturing process for creating biopharmaceuticals is extremely complex and it demands time, knowledge, and attention. The process involves sophisticated machinery and other equipment, and it requires constant monitoring from biologists and other technical people, because if something goes wrong at any stage of the process, then it could mean thousands or even millions of dollars lost in research and production costs. Consequently, exceptionally accurate and reliable pieces of equipment are required for the biopharmaceutical manufacturing process, and this includes industrial scales. If you are broadly unaware of how biopharmaceuticals are made, then you can really only imagine how challenging the process of creating them is. The first thing to know about biopharmaceuticals is that biopharmaceuticals may be larger and more complex than other types of pharmaceuticals. Also, biopharmaceuticals are often administered to patients by injection, not in pill form. The main difference between biopharmaceuticals and other pharmaceuticals is that biopharmaceuticals are manufactured within living systems, like microorganisms or plant and animal cells, while standard pharmaceuticals are created through a series of chemical synthesis steps. Using biotechnology processes and bioengineering, biologists create biopharmaceuticals by modifying the DNA in cells and programming the cells to fight specific diseases, like: HIV/AIDS, cancer, diabetes, and rare blood disorders. Creating identical cells is nearly impossible. Therefore, after 1 original cell is created, it is used to make every dose of that medicine forever. The very first biopharmaceutical was made in the 1940s and surely you’ve heard of it—does Penicillin ring a bell? However, the biopharmaceutical industry didn’t really take off until the 1970s and 1980s. Today, there are more than 200 biopharmaceuticals, or biologics, in existence. Clearly, it’s a tough task in itself to create original cells capable of fighting diseases. But, once it’s done, the biologists must make copies of the original cells in order to amplify the affects of the cells and create drugs that can benefit sick patients. Every step of the manufacturing process—from cell creation through to the distribution of drugs to doctors and patients—is critical, and mistakes and inconsistencies must be avoided at all costs. On average, 250 quality control checks are required throughout the biopharmaceutical manufacturing process, while only 50 are necessary for the creation of small molecule drugs (pharmaceuticals). Anywhere accuracy is a necessity, industrial scales can serve a purpose. In fact, many biopharmaceutical companies currently use industrial scales for biopharmaceutical manufacturing., For example: Spectrum Labs is a client of Arlyn Scales. This company incorporated Ultra Precision Scales by Arlyn Scales into their own equipment. Arlyn Scales’ Ultra Precision Scales, which use Arlyn Scales’ own Surface Acoustic Wave (SAW) technology, guarantee extreme accuracy and are a better option than other high-resolution scales currently on the market. Finding a scale that can display small changes in weight for light loads is not very difficult. However, when it comes to determining small changes in weight for heavier loads, finding a scale that is capable of doing this is not the easiest thing to do. For example, a descent 100 kg high-resolution scale might measure loads in increments of 20 grams. But, let’s say a biopharmaceutical company needs to measure 50 grams of material. Using a high-resolution scale with a readability of 20 grams, the company would only be able to measure out 40 or 60 grams, not 50, and this means the company could easily have an error as high as 20%. Fortunately, 100 kg Ultra Precision Scales by Arlyn Scales measures units in increments of 1 gram. If the same biopharmaceutical company uses an Ultra Precision Scale instead of a regular scale, then the risk of error is reduced from 20% to 2%. 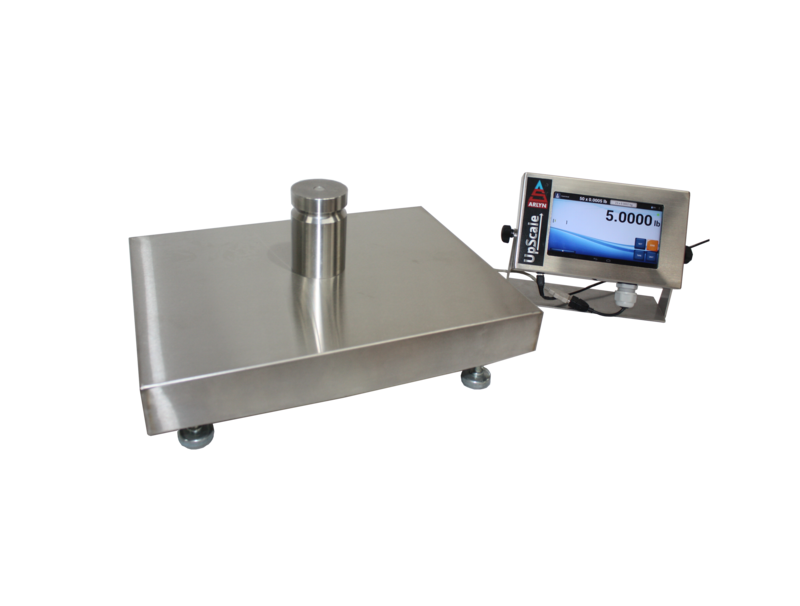 Spectrum Labs uses an Ultra Precision Scale from Arlyn Scales that has a maximum capacity of 60,000 grams. This scale allows the company to measure high capacities of materials while simultaneously regulating small changes in weight. Consequently, the equipment is able to produce consistent and affective biopharmaceuticals. As you can see, industrial scales are useful in the biopharmaceutical manufacturing process, because the scales can be used to accurately measure materials, whether the materials are being added to or taken out of mixtures. But, that’s not everything industrial scales can do for the biopharmaceutical industry. Biopharmaceuticals must be manufactured consistently. Otherwise, undesirable health consequences could arise. Therefore, biopharmaceutical manufacturing is a precision science, and consistent and reliable performance is the key to manufacturing success. Ultra Precision Scales makes it possible for biopharmaceutical manufacturing companies to create consistent and affective medications again and again. Moreover, other Arlyn Scales’ products, like Bench Scales, can be incorporated into the manufacturing and distribution processes for biopharmaceuticals. With increased accuracy, comes enhanced inventory management, because you have a better idea of how much you have of what. Inventory management goes hand in hand with a company’s checkbook. So, if your business has a better grasp on inventory management, then you can more accurately price your products and bill customers accordingly. Furthermore, Arlyn Scales can help biopharmaceutical manufacturing companies achieve advanced data acquisition, which can assist with inventory management. Arlyn Scales understands the importance of accuracy in the biopharmaceutical industry. That’s why our extremely accurate scales improve every aspect of business for biopharmaceutical manufacturing companies. In addition to enhanced quality control and improved inventory management, Arlyn Scales’ products can also help biopharmaceutical companies decrease production costs. It kind of goes back to what we said in the beginning: “if something goes wrong at any stage of the process, then it could mean thousands or millions of dollars lost in research or production costs”. Increased accuracy means fewer mess-ups! Fewer mess-ups mean fewer do-overs, which means less money spent on overall production. In addition to saving biopharmaceutical manufacturing companies time and money with our extremely accurate industrial scales, Arlyn Scales can also help biopharmaceutical manufacturing companies create automated systems. For example, we can set up programs that control filling or batching operations. System automation helps companies reduce human error, minimize complexity, improve productivity, and lower costs. Every day, biopharmaceuticals save lives and make lives more livable. Arlyn Scales is proud to be a part of the biopharmaceutical manufacturing processes for many biopharmaceutical companies. Visit Arlyn Scales’ website today to learn more about our selection of Ultra Precision Scales and other products. Call us at 800-645-4301 or fill out our online contact form with any questions or comments. We look forward to hearing from you.